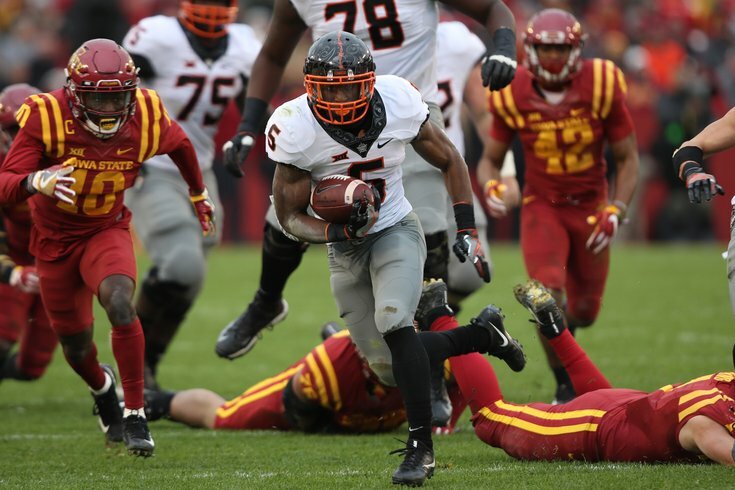 Oklahoma State's Justice Hill is a shifty runner who could interest the Eagles. The college football season begins tonight, with some smaller school games on TV, and a handful of games scattered throughout the week. Next Saturday will begin the full college football slate of games. As long as you're taking in some of the action this week, here are some players who could make sense for the Philadelphia Eagles in the 2019 NFL Draft. Carl Granderson, DE, Wyoming (6'5, 261): Wyoming at New Mexico State, Saturday, Aug 25, 8:00 p.m.
Granderson was a lightly-recruited player who played linebacker and tight end in high school, while being listed at 6-foot-6, 185 pounds. You can see how skinny he was in his high school highlight reel. At Wyoming, he is now listed at 6-foot-5, 261 pounds, so he put on over 70 pounds to play DE, and apparently shrunk an inch. Granderson has good quickness from his DE spot, but is still developing. He could make sense for an Eagles defense that could have time to develop young pass rushers, depending on how many of their defensive ends return in 2019. The Eagles have three defensive ends in their rotation who are 30-plus years of age in Brandon Graham, Michael Bennett, and Chris Long. While they spent a first round pick on Derek Barnett in 2017 and a fourth round pick on Josh Sweat in 2018, it's a pretty good bet that they are going to continue to try to load up on defensive ends, especially considering how crucial it is for the front four to create pressure without the aid of blitzes in Jim Schwartz's scheme. Justice Hill, RB, Oklahoma State (5'10, 190): Missouri State at Oklahoma State, Thurs, Aug 30, 8:00 p.m. The last two drafts have been very strong at the running back position, and this year should be no different. That's fortunate for the Eagles, who only have one running back in Corey Clement that is a near certainty to be on the roster in 2019. One of the more fun running backs to watch from this next class is Hill, who is a smaller, shifty runner who makes guys miss. Despite his small size, Hill has carried a heavy workload for Oklahoma State, and has racked up big numbers as a runner. However, the area where his production is deficient is in the receiving game, as he has just 36 catches for 236 yards and 1 TD so far in his college career. Ideally, you would prefer a 5-foot-10, 190 pounds back to have ability as a receiver so that they can be used on third down. With Oklahoma State losing quarterback Mason Rudolph (3rd round), wide receiver James Washington (2nd round), and Marcell Ateman (7th round) to the NFL Draft, perhaps the Cowboys will lean more on Hill in the passing game. That's what he'll need to show this season to make himself more attractive to NFL teams. Nate Herbig, OG, Stanford (6'4, 348): San Diego State at Stanford, Fri, Aug 31, 9:00 p.m.
Herbig is going to have to cut weight to be anything more than a late-round prospect, but the Eagles could use some interior offensive line help, and Doug loves him some mauling, run-blocking guards. T.J. Edwards, LB, Wisconsin (6'1, 242): Western Kentucky at Wisconsin, Fri, Aug 31, 9:00 p.m. In 2017, Edwards had 81 tackles (11 for loss), two sacks, 4 INTs, and 7 pass breakups. He considered leaving a year early for the 2018 NFL Draft, but was given a "return to school" grade by the NFL draft advisory board. To note, you can either receive a first round grade, a second round grade, or a "go back to school" grade. It will be hard for Edwards to improve on his production over the first three seasons of his college career, so I'm not sure how much his draft grade could reasonably be expected to improve, considering he lacks elite athleticism. As such, he could be an option in the middle rounds for the Eagles. With Jordan Hicks' durability concerns and the fact that Hicks is entering into a contract year, linebackers should be of interest. Edwards brings playmaking ability in pass coverage, which should appeal to Schwartz. David Edwards, OT, Wisconsin (6'7, 315): Western Kentucky at Wisconsin, Fri, Aug 31, 9:00 p.m.
Like Stanford above, Wisconsin also produces its share of offensive linemen. Like Lane Johnson, Edwards was a former quarterback, as he ran the option in high school at 215 pounds. He enrolled at Wisconsin as a tight end, but moved to right tackle. As you might imagine, he is an athletic tackle who excels at getting to the second level in the run game, as well as mirroring and matching as a pass protector. His 6-foot-7 frame and long arms don't hurt. Edwards' fit with the Eagles is questionable. One of the new trends in the NFL is that right tackles are beginning to be viewed as having importance similar to left tackles, because of the number of elite pass rushers primarily lining up against the right tackle. The Eagles may opt to just leave Lane Johnson at RT whenever Jason Peters retires. Typically, the Eagles like their OT prospects to have experience both at LT and RT, and Edwards has only played RT. If they leave Lane right where he is at RT, Edwards would be forced to learn a new position, which isn't impossible, but it's one extra obstacle. Additionally, if Halapoulivaati Vaitai is to become a starter at one of the OT spots (far from a certainty at this point), the Eagles would prefer their swing tackle to be able to play both LT and RT. Still, Edwards' skill set fits perfectly within the Eagles' scheme, and is worth watching.